WASHINGTON ― Christine Blasey Ford provided a potentially crucial new detail Thursday about the alleged 1982 assault she says she experienced at the hands of Supreme Court nominee Brett Kavanaugh. Six to eight weeks after Kavanaugh allegedly assaulted her, Blasey went with her mother to a local Safeway market in Potomac, Maryland, and saw Mark Judge, a friend of Kavanaugh's who was in the room with them during the alleged incident, she told the Senate Judiciary Committee during her Thursday morning testimony. Judge was working there at the time, arranging shopping carts, according to Blasey. She said she said hello, noting that the two had been previously friendly for some time. Judge "looked a little ill" and his face went pale, Blasey said. Earlier, she had said Judge was present in the room when Kavanaugh jumped on top of her, ran his hands over her body and placed a hand on her mouth to drown out her yells. 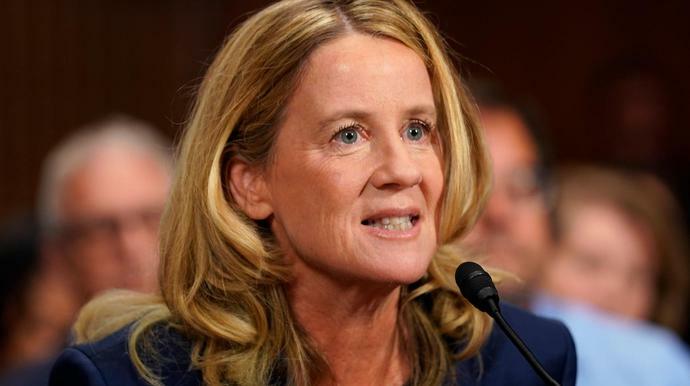 She made eye contact with him twice, she told the Senate, and his laughter along with Kavanaugh was the strongest part of her recollection. The revelation matters because it would help pin Blasey's claims to a specific point in time. She repeatedly referenced it in further responses during her testimony. When pressed by a prosecutor representing the all-male GOP membership of the committee about the specific date of the alleged assault, Blasey responded by saying, "If I knew when Mark Judge worked at the Potomac Safeway, I could be more helpful in that way." GOP leadership in the Senate resisted calls to ask Judge to testify at the Thursday hearing along with Blasey and Kavanaugh. Blasey's comment underscored why such a testimony might be key ― and Judge's own personal statements hint at it as well. He wrote about working at a local supermarket in his book about his youthful drinking, New Yorker journalist Jane Mayer noted on Twitter. (Mayer is a co-author of a piece detailing the second set of allegations against Kavanaugh by Deborah Ramirez, one of three women who have accused him of sexual misconduct). Judge left the D.C. area last week after he came under public scrutiny. On Monday, the Washington Post found him staying at a beach house in Delaware. "I have no comment at this time," a customer service representative at the Potomac Safeway told HuffPost when asked for comment. The representative declined to share if Safeway had the relevant records. His main job is to sit on the U.S. Supreme Court, but Justice Stephen Breyer also chairs the jury of the Pritzker Prize - the world's top honor in architecture. WASHINGTON (AP) - The Supreme Court on Tuesday seemed inclined to rule against workers on oil drilling platforms off California who want to be paid for the off-work time they spend on the platform, including sleeping.